In 1990 Kirin launched a very special beer in Japan, called "Ichiban Shibori", which literally translates as "first pressing". This distinctive beer is fermented using only the very first wort, which contains less bitter-tasting tannins. Its very mild, pure and smooth taste caused a sensational boom when launched in Japan, subsequently becoming the third best selling brand there amongst Japanese beers. 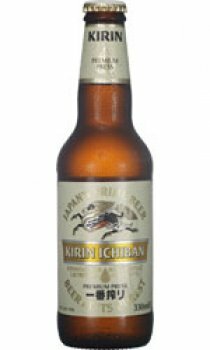 In 1993 responding to requests from enthusiastic customers, Charles Wells Ltd, started to produce Kirin Ichiban in the U.K. Since then, like Kirin beer, Kirin Ichiban has attracted a lot of customers in Europe with its unique taste. Based on this unique quality, Kirin Ichiban was awarded the Monde Selection Gold Medal in from 1997 through 2001. There is no doubt that Kirin Beer, with its well balanced taste, will always go down well with Japanese food like Sushi, Sashimi and Tempura. Kirin Beer is also the perfect combination with all kinds of Oriental and European food - truly a cosmopolitan taste. Neil Gibbs in his comment above, doesn't name the other Asian beers he likes. For myself, there are only two which give me a memorable flavour: Kirin and Singha: both are very different. Myanmar beer is also surprisingly enjoyable, but not as good as those two. I guess it's a personal thing. Last week, I invited friends to a celebration in a Youngs draught beer pub by the river in Richmond, followed by a private party at home with Kirin. those who were beer drinkers: the majority said it was the tastiest beer night they could remember. I ran a free house in London which served Charles Wells beer: I loved the Bombadier but it gave me terrible hangovers; the two aforementioned beers don't! Congrats to Charles Wells for brewing Kirin! Quite simply the best lager I have ever tasted. Not watery, or overpoweringly strong. Crisp, clean and refreshing with no aftertaste. To be honest, I expected more. This lager was by no means unpleasant however, having tasted countless other Asian and Asian inspired lagers and ales, Ichiban didn\\\'t rank top 5 for me. 3 stars!